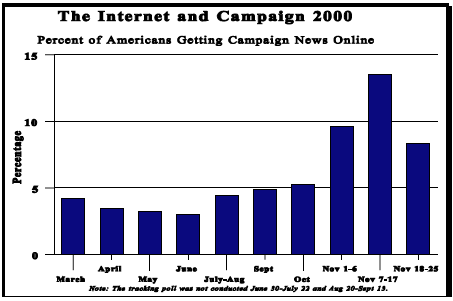 Campaign 2000 firmly established the Internet as a major source of election news and information. But as the audience for online campaign news has expanded — increasing fourfold over the past four years — it has gone more mainstream in its preferences and pursuits. A majority now cites convenience, not a desire to tap new or different information sources, as the main reason they go online for election news. Many more election news consumers gravitate to the online addresses of major news organizations and web portals than seek out specialized political sites or the candidates’ own sites. Nearly one-in-five Americans (18%) say they went online for election news during this year’s campaign, up from 4% who did so in the 1996 campaign. Fully one-third of the online population, which itself has grown dramatically over the past four years, got election news from the Internet. Veteran online users were far more likely to get election news than Internet “newbies”: 45% of those who have been online for at least three years used the Internet to access election information, compared to 17% of those who began going online in the past six months. The Pew Research Center’s latest nationwide survey — conducted during October and November among 4,186 online users, in association with the Pew Internet & American Life Project — finds that election information draws more election news consumers than participation in online political activities. Nearly seven-in-ten of those who went online for election news sought out information on the candidates’ positions. Convenience is the Internet’s main appeal as a campaign news source. More than half of those who went online for election news (56%) cited convenience as their main reason for doing so, up from 45% in 1996. During that campaign, when the Internet had yet to fully emerge as a news medium, a majority of election news consumers (53%) said they went online because they weren’t getting all the news they wanted from traditional media; just 29% cited that factor in the current survey. The online audience for election news has shown less interest in engaging in other political activities than it has in accessing political information. But the Internet is beginning to affect the way candidates and voters interact. A sizable minority of those who went online for election news (35%) registered their views in Internet political polls, while 22% used email to contact candidates and 5% made campaign contributions over the Internet. On a day-to-day basis, interest in online campaign news peaked around Election Day. Fully 12% of Americans went online for political news on November 7, and 18% went online the day after the election — a more than fourfold increase in the normal traffic for political news. The continuing drama of the post-election story and its fast-moving pace kept people online for election news in the week following November 7. Between 11% and 15% of all Americans followed the story online on any given day during this period. The current poll was conducted as part of a larger effort to track Internet use over time. The Pew Internet & American Life Project has been conducting a daily tracking poll almost continually since March 1, 2000, measuring online usage. The level of campaign news consumption remained remarkably stable from March through October; during this period, roughly 3% to 5% of Americans got campaign news online on a typical day. This pattern was not influenced dramatically by important primary contests in March, nor by the conventions or the fall debates. While 18% of all Americans say they went online for news about campaign 2000, that figure rises to 28% among those who voted on Nov. 7. Similar questions asked of voters on the Pew Research Center Post-Election Poll and the Voter News Service exit polls found a comparable 30% saying they got news about the election from the Internet. That represents a threefold increase from 1996, when only 10% of voters got election news online. The increase in the use of the Internet for election news over the past four years has been dramatic among most major demographic groups. However, younger people, as well as more educated and wealthier individuals remain the most likely to consume this type of news online. Today, people age 18-29 are more than twice as likely as those over age 50 to get news about the election online (25% vs. 10%). This disparity is driven largely by the fact that a much higher proportion of young people use the Internet in the first place. Looking only at Internet users, the survey shows that those under 30 are only slightly more likely to use the web as a source of election news (34%) than are those over 50 (30%). College-educated citizens are more than three times as likely to get election news online than are people with no more than a high school degree, but this also can be explained largely by the overall disparity in Internet use based on education. In 1996, 9% of college graduates got campaign news online, a figure that has risen to 33% today. The comparable increase among those with a high school degree or less is far smaller in absolute terms, from 2% in 1996 to 8% today. Similarly, members of higher-income households have dramatically increased their use of the web for campaign news, up from 6% to 30% in households earning over $50,000 per year. The comparable rise among those earning under $30,000 is from only 2% in 1996 to 10% today. While 21% of men get at least some news about the election online, only 15% of women do. Though men are somewhat more likely than women to be online users, this gender gap exists even when the analysis focuses solely on the connected. Fully 37% of men who use the Internet get election news while they are there, compared to only 29% of women. 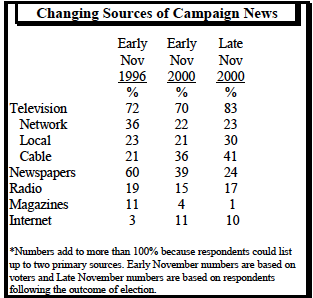 With convenience given high priority, it is perhaps not surprising that when Americans went online to learn about campaign 2000, they turned primarily to the major news organizations. 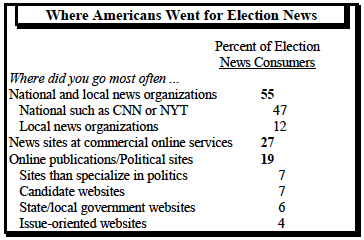 When asked where they went most often for news about the 2000 elections, more than half of election news consumers said they went to the websites of major news outlets such as CNN or the New York Times, or the websites of local news organizations in their area. Nearly three-in-ten said the news sites of commercial online services such as America Online were their primary source for election news. And roughly 20% said they relied mostly on more specialized sources such as political websites, candidate sites, issue-oriented sites, and local government sites. In spite of the overall increase in online campaign news consumption, political websites and candidate sites were less popular, on a percentage basis, this year than in 1996. Only 7% of those who went online for election news said they relied mostly on sites that specialize in politics, down from 15% in 1996. The falloff in use of candidate websites has been even more pronounced: 7% this year down from 25% in 1996. When asked in an open-ended format which specific online sources they used most often for campaign news, more named CNN.com than any other single site. Nearly one-quarter of those who got election news online said CNN’s website was their primary Internet source — by far the most frequently mentioned source. The next most popular online source, at 16%, was America Online. Yahoo was cited by 8%, MSNBC.com by 6% and Microsoft/MSN by 4%. CNN was also the top destination for election news consumers in 1996, though it wasn’t as dominant. When these open-ended responses are grouped into broader categories, they reinforce the conclusion that the mainstream news organizations dominated Internet coverage of campaign 2000. Nearly half of campaign news consumers named one of the major news organizations’ websites when asked which one source they turned to most often. Roughly one-third (34%) named a commercial online service, web portal or search engine. Only 7% named online magazines such as Salon or Slate or political websites, such as Voter.com. 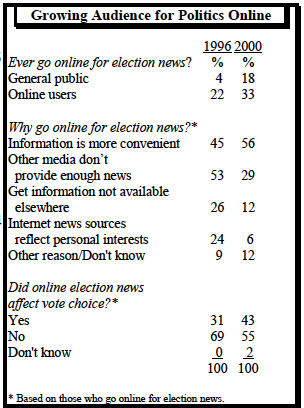 In addition to identifying their primary online sources for election news, respondents were asked whether they had ever visited a number of specific websites for news or information about the 2000 election. CNN.com came out on top again: 20% of all online users say they went there for election news, as did 59% of election news consumers. News features on websites like Yahoo and MSN were also highly rated: 22% of all online users visited these types of sites for campaign news, as did 57% of election news consumers. One-in-five online users visited MSNBC.com for campaign news, as did more than half of all election news consumers. The websites of the broadcast TV networks, as well as those of national newspapers such as the Washington Post and the New York Times, were also used frequently by election news consumers — 45% and 33%, respectively, say they visited these sites for news about campaign 2000. Websites devoted to local community news were visited by roughly three-in-ten election news consumers. Over a quarter cited the AOL News Channel. While more Republicans than Democrats went online for election news (37% of Republican online users vs. 34% of Democrats), there are few significant differences between the party groups with regard to the sites they visited. The top five election news sites among Democrats and Republicans who went online for campaign news are identical. Democrats are somewhat more likely than Republicans to have visited the websites of the national newspapers, as well as sites devoted to news or information about their local communities. Men and women differ only somewhat in terms of where they went on the Internet for election news. Among election news consumers, men are more likely than women to have visited CNN.com and the Wall Street Journal’s home page, while women were more likely than men to visit AOL’s news channel for campaign news. More experienced Internet users visited the websites of major news organizations at higher rates than did Internet newcomers. Election news consumers who have been online more than three years are significantly more likely to have visited CNN.com, MSNBC.com, the websites of the national newspapers, and the Wall Street Journal’s home page compared to those who have come online with the past year. Newcomers were slightly more likely to have availed themselves of AOL’s news channel for information on the elections. Overall, the most experienced Internet users turn to the websites of the major news organizations when seeking election news, rather than commercial online services, web portals and search engines by a margin of 54% to 30%. Those who have come online within the last year divide their loyalties more evenly — 40% opting for the websites of major news organizations, 36% using primarily online services, portals and search engines. Respondents who visited the various news sites in search of election news were also asked to evaluate their usefulness. Nearly six-in-ten (57%) of those who went to CNN.com for election news rated that site as very useful, the highest percentage of any website tested. 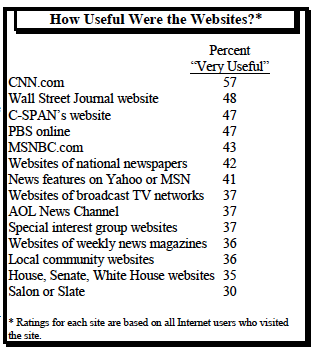 The Wall Street Journal’s site was judged to be very useful by 48% of those who visited it, and nearly as many (47%) gave C-SPAN’s website and PBS online a very useful rating. MSNBC.com and the websites of the national newspapers also received high marks for usefulness by more than four-in-ten of their users. Online-only magazines, such as Salon and Slate, were among the lowest rated for campaign news — only 30% found them very useful. Campaign websites were used much less frequently than were media-sponsored sites. Only 8% of online users and 28% of election news consumers visited the website of a candidate or campaign to get news or information about the 2000 elections. Even fewer visited the Bush/Cheney and Gore/Lieberman sites — 7% and 6% of online users, respectively (less than one quarter of election news consumers). Just over one-third of online users who visited these sites found them very useful. The importance of convenience in the rise of the Internet as an election news source is seen in a number of ways. Not only do most election news consumers cite that as their top reason for going online for such information, but also 45% of all Internet users say they encounter election news inadvertently, when they have gone online for other purposes. Veteran Internet users are the most likely to run into election news by happenstance while going online for other purposes, and more in this group cite convenience as their main motivation. Newer Internet users are the least likely to cite convenience as the reason they log on for election news. 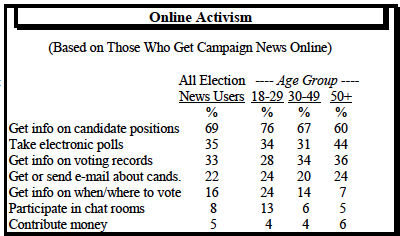 The reasons for seeking election news online also vary according to age and gender. 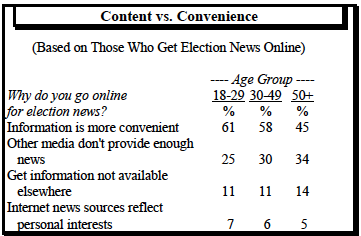 Less than half of older users cite convenience as their chief motivation for seeking election news online, compared to nearly 60% of those under 50. These older election news consumers are somewhat more likely than their younger counterparts to say they go to the web because they don’t get all the news and information they want from traditional news sources. Men, too, are slightly less likely than women to cite convenience as their reason for seeking election news online, and are more driven than are women by a desire for more news than the newspapers or television can provide. Not surprisingly, the vast majority of election news consumers say they went online for information about the presidential race rather than down-ballot contests. Fully 85% of this group went on the Internet for information about the presidential campaign, while 17% looked for material related to local races, and 15% were primarily interested congressional elections. For the most part, those who go online for election news are simply seeking information, and they participate in other online activities at much lower rates. Fully 69% of election news consumers sought information about the candidates’ positions on the issues, and 33% sought background on candidates’ voting records. Younger users were more interested than older ones in information about candidate positions and when and where to vote, while older users were somewhat more interested than their younger counterparts in information about candidates’ voting records. Participating in Internet political polls was a relatively popular activity in the 2000 campaign, with 35% indicating they had registered their views in an online survey. Other activities — particularly participating in online political chat groups — held far less interest for the online election news audience. Just 8% joined such chat forums this year, compared to 31% who did so in the 1996 campaign. Younger election news consumers were more likely to participate in chat groups than their older counterparts, but older consumers were more likely to register their opinions in electronic polls. In general, Internet veterans and newcomers participated in online political activities at comparable levels. Republicans hold a clear advantage in online activism over Democrats, measured in terms of interactive participation. More GOP consumers of online election news reported sending or receiving e-mail supporting or opposing a candidate (29% to 20% among Democrats); Republicans were also more likely to participate in online polls (39% to 31%) and more likely to contribute money through candidate websites (6% to 3%). Whites tend to go online at higher rates than minorities. But there are few differences in what whites and minorities do once they log on, at least as far as election news is concerned. Similar percentages whites and minorities got news about the elections online, and they cite the same reasons for going there — primarily convenience. However, two differences do arise with respect to race and ethnicity. Nearly one-in-four (23%) blacks and 36% of Hispanics who go online for election news say they sought information about when and where to vote, compared to only 15% of whites. Similarly, minority news consumers were more likely than whites to participate in online discussions about the elections. Fully 24% of black and 12% of Hispanic online news users took part in chat groups, compared to only 6% of whites. With more and more Americans turning to the Internet for election news, there is strong evidence that what they learn is making a difference in how they vote. 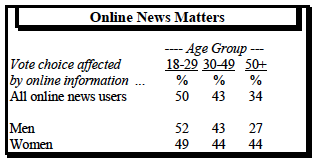 Younger voters, in particular, found online information to be influential. While half of online news consumers under age 30 say their voting decisions were affected by information they received, 43% of those 30-49 and 34% of those 50 and older say the same. This pattern is most notable among men, with younger men nearly twice as likely to be affected by online information as older men. Women of all ages found online information be about equally persuasive. Internet veterans not only are more likely to follow election news online, they also are more likely than Internet newcomers to be influenced by that news. Fully 49% of those who have been online for more than three years say online information made them more or less likely to vote for a candidate, compared to only 38% of those who went online more recently. Despite the rise of the Internet as a source of election news, most Americans who followed the results of the presidential election and its confusing aftermath overwhelmingly turned to television for information. More than eight-in-ten of those who were at least somewhat interested in the election results (83%) got their news from television. As was the case during the campaign, cable television dominated the network and local outlets as a primary source of news about the election results and post-election wrangling. Fully four-in-ten (41%) of those who have been tracking these developments turned to cable, compared to 30% who tuned into local television news and 23% who cited network news. Only 24% cited newspapers as their primary source for information on the results of the election and its aftermath. Just one-in-ten cited the Internet as a primary source, but another 11% who relied mostly on other forms of media also say they have gotten some news about the election online. Clearly, many of those who are following this story online are political junkies: 21% say they check in on Internet sites for updates several times a day. Overall, slightly more than one-third of the public (35%) has paid very close attention to the ongoing political battles over the presidential election. Another 39% say they have followed this story fairly closely. Interest in the post-election situation is comparable to public attentiveness to major news developments in the Monica Lewinsky affair. But nearly twice as many Americans (68%) paid very close attention to last year’s shootings at Columbine High School. Interest in this matter declined over the duration of the survey. In the initial post-election period (Nov. 10-17), 38% of the public paid very close attention to the stalemate: in week two (Nov. 18-26), that figure dropped to 31%.